Gaz Beadle is quitting Geordie Shore! Gaz Beadle has announced he's quitting Geordie Shore to move to Australia. Charlotte Crosby speaks out over report claiming she’s quit Geordie Shore! Charlotte Crosby has spoken out about a report which claimed she's quitting Geordie Shore. Charlotte Crosby QUITS Geordie Shore because of Gaz Beadle! Charlotte Crosby has quit Geordie Shore after Gaz Beadle slept with his Ex On The Beach co-star. Geordie Shore’s Gary Beadle naked snapchat video has leaked online! Geordie Shore's Gary Beadle snapchat video is currently going around the internet which shows off his manhood. Really, it has. 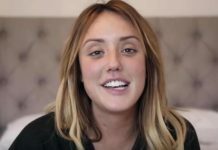 Charlotte Crosby is not engaged as boyfriend Mitch Jenkins pulls prank! Charlotte Crosby isn't engaged after last night's news as the reality star reveals her boyfriend Mitch Jenkins has pulled a prank.